Hello Broadwell! Intel introduces the next generation of CPU technology. 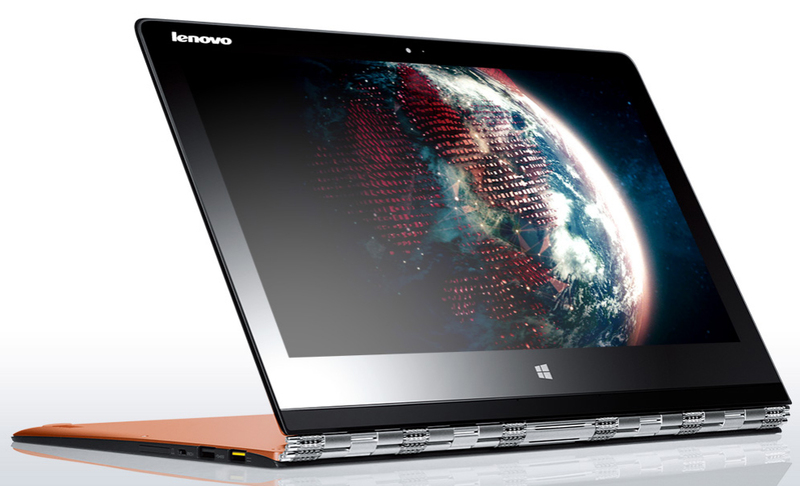 Lenovo’s brand-new Yoga 3 Pro Convertible is one of the first devices with the new Core-M processors. How does the new chip perform compared to Intel’s Haswell ULV processors? What can you expect from the third generation of the Lenovo Yoga? Here are our initial impressions and measurements ahead of our upcoming test. The Watchband hinge is made of aluminum and steel elements. Recently on the show floor, and now already in review at Notebookcheck – Lenovo’s Yoga 3 Pro is a worthy platform for the first use of Intel’s brand-new processor technology. Not only the new Intel Core-M CPUs ("Broadwell") attract interest, the device also has a lot of innovations that should ensure a position in the spotlight: For example, the new Watchband hinge that allows a 360° rotation of the display as well as a thinner construction of the base unit compared to its predecessors. Another interesting aspect is the QHD+ multi-touch display with 3200x1800 pixels. Integrated AC WLAN, more than 7 hours battery runtime, and a weight of just 1.2 kg (~2.65 lb) for the 13-inch device complete the specifications of the Yoga 3 Pro. In advance of our in-depth review of the Yoga 3 Pro, we want to share with you our first measurements and benchmark results. Multimode: Lenovo advertises four operating modes for the 360° hinge. At first glance the device confirms the size comparison below: This is the thinnest base unit we ever held in our hands in this product category. Lenovo specifies the "thickness" of the system with just 12.8 millimeters (~0.5 inches), which means Intel’s Ultrabook Limits almost appear outdated. The drawback of this radical slimming cure: Even standard USB connectors have contact with the base, and thicker USB sticks can already lift the case. This means you should avoid permanent connections. The stability of the base unit is surprisingly good. You can only twist it by a couple of millimeters with a lot of force. The thin display on the other hand, allows more movements and produces creaking sounds. Pressure on the display frame also results in visible distortions on the panel. The general material impression is acceptable. The visible components use a combination of magnesium and aluminum parts, the matte finish is sophisticated and not too susceptible to dirt. However, this kind of surface is not really easy to clean. The build quality of our review unit is on a very high level, we could only find some uneven gaps at some edges after an intensive search. The new hinge leaves a good impression as well, and surprisingly, keeps the display well in position. You need two hands to open the lid. Thin: The USB port just fits into the base unit. 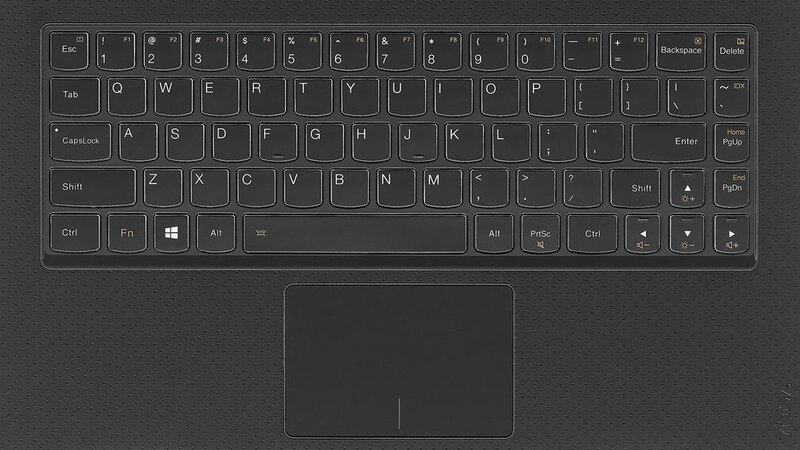 The first thing you will notice, is that the keyboard does not have any F-keys, and Lenovo also has removed several special features completely. Instead, you get number keys with secondary and tertiary functions. The keyboard has a white background illumination, but it cannot be dimmed. The stroke is comparatively firm, and we would say the key travel is normal after our first inputs, despite the very thin base unit. All in all, the keyboard leaves a good impression; there is no clattering, the keys are accurate, and the pressure point is well defined. The touchpad has a decent size and a glass-like surface with good gliding capabilities. The precision seems to be fine, the pressure point of the pad (ClickPad) is pretty firm and has a short travel. Another highlight of the Lenovo Yoga 3 Pro is the display resolution, which was raised to QHD+ (3200x1800 pixels). Less impressive, however, are our measurement results of the display panel. The maximum brightness is at almost 300 cd/m² and the contrast is very low with 362:1. Both the grayscale performance and the color accuracy are decent out of the box, with a DeltaE deviation slightly over 3. 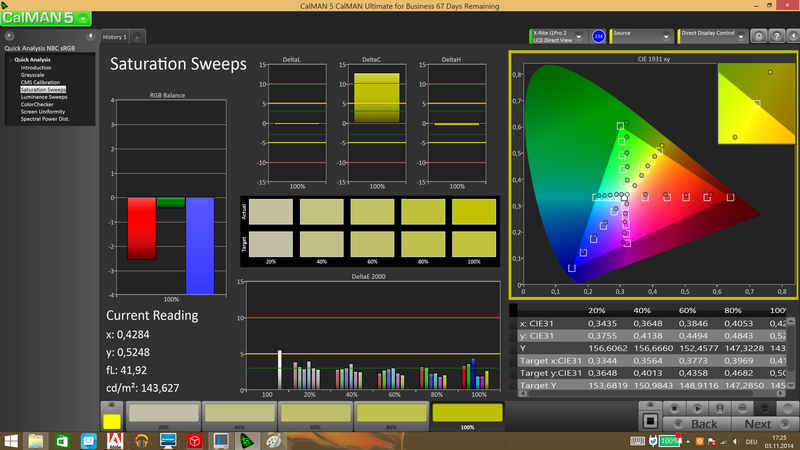 Our first try to calibrate the panel failed. 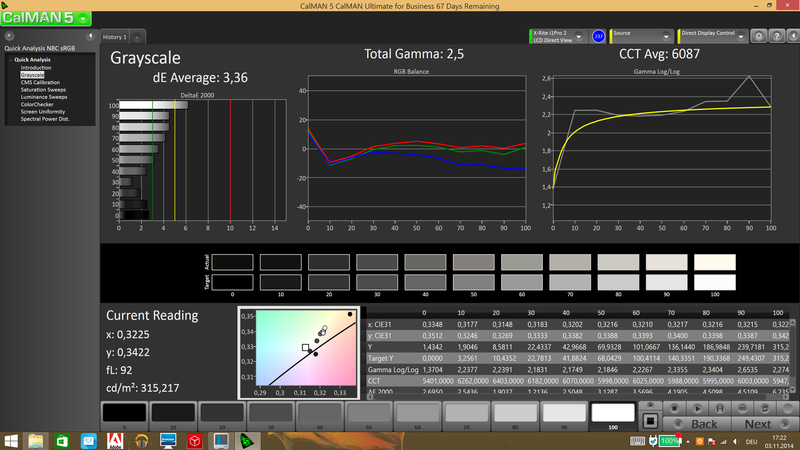 The brightness distribution is very good with 88%, and you can hardly see any screen bleeding. Subjectively, the picture does not have a high contrast. The viewing angle stability is good with vertical shifts, but the picture appears slightly gray from an angle above, despite the IPS technology. Still, overall the display leaves a positive impression, not least because of the high resolution and the resulting high sharpness. 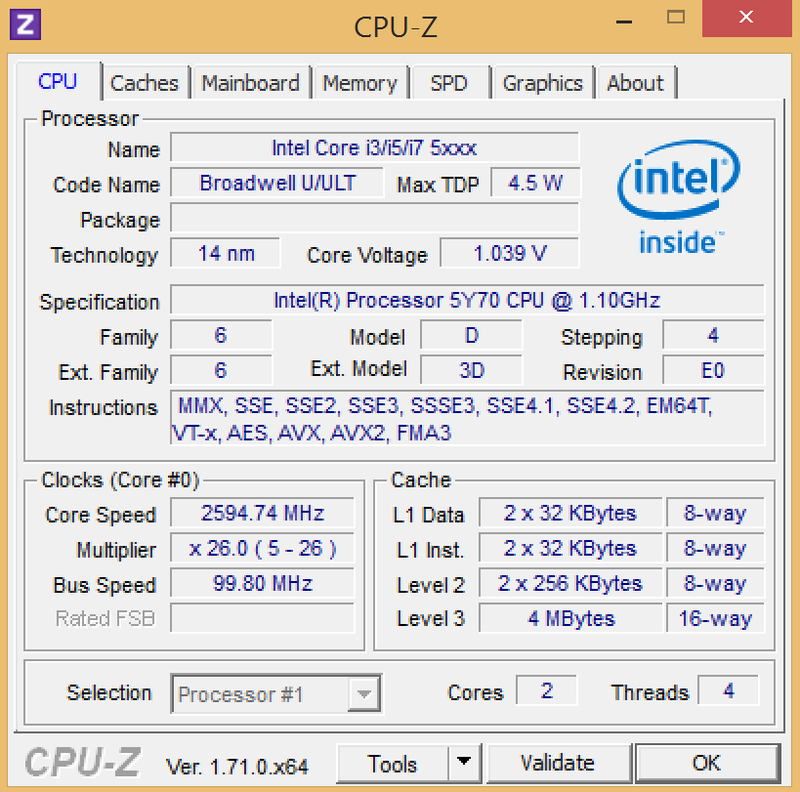 Brand-new: Intel Core M-5Y70 "Broadwell"
There it is, Intel’s first Broadwell processor in the Lenovo Yoga 3 Pro. The Intel Core M-5Y70 is manufactured in the new 14 nanometer process, and therefore represents a shrinking of its predecessor (Haswell). 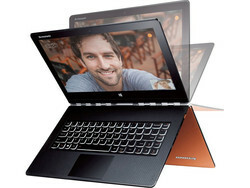 The new Broadwell processors are primarily designed for thin and slim devices with passive cooling. However, the Yoga 3 Pro still has an active cooling solution. 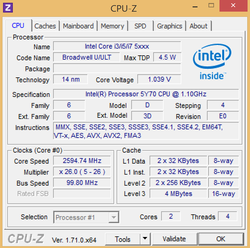 The clock varies between 1100 up to 2600 MHz. More information about the chip are available on our dedicated page for the M-5Y70. The integrated graphics unit is the new Intel HD Graphics 5300, more details are also available on the GPU page of the HD Graphics 5300. We can utilize the full Turbo potential in our first performance tests, but only for a short time. The simultaneous load of the GPU and the CPU resulted in throttling. Still, the Yoga 3 Pro is very fast in practice, the Turbo compensates peak load, and we cannot really notice any differences compared to Haswell ULV systems. The gaming performance should be below systems with the HD 4400 due to the throttling issues under simultaneous load of the CPU and GPU. Our configuration has a 256 GB SSD, since it is a configuration for the U.S. market. Systems for Germany will only be equipped with 512 GB SSDs initially. Our first benchmarks show that the Core M-5Y70 is roughly on par with the i5-4210Y inside the HP Split x2 13 (Cinebench R11.5 Rendering). Systems with the i5-4200U (ThinkPad Yoga and Yoga 2) are around 16 up to 19% faster when you only stress one core, and between 38 up to 45% in the Multi-Core test. According to the Cinebench OpenGL test, the HD 5300 GPU is slightly slower than the HD 4400 inside the ThinkPad Yoga and the Yoga 2 Pro. Update 11/06/2014: Another run of Cinebench R11.5 showed a performance increase between 10 and 20%, so we suspect a mistake – possibly caused by a background activity – during the original measurement. The following chart already shows the updated values. Contrary to the first assumptions, we once again want to say that the Lenovo Yoga 3 Pro is NOT a fanless device. During everyday use we can notice that the fan occasionally starts to spin, but the noise is on an acceptable level. The situation is not too bad under maximum load, either. The temperatures are never critical, both on the components and on the case surfaces. With an idle consumption between 3.7 Watts (lowest display brightness) up to 10.7 Watts, we can already see the big impact of the display brightness. We can measure short peaks of more than 30 Watts under load, and the consumption leveled off at around 20 Watts. Considering these values and the Windows prediction for the runtime, we think that the realistic runtime in our WLAN scenario will be around 6 hours. Detailed measurements will follow in our comprehensive review. Considering our first impressions and the initial measurement results, the Yoga 3 Pro seems to be a high-quality device that attracts attention with its thin construction and the innovative display resolution. 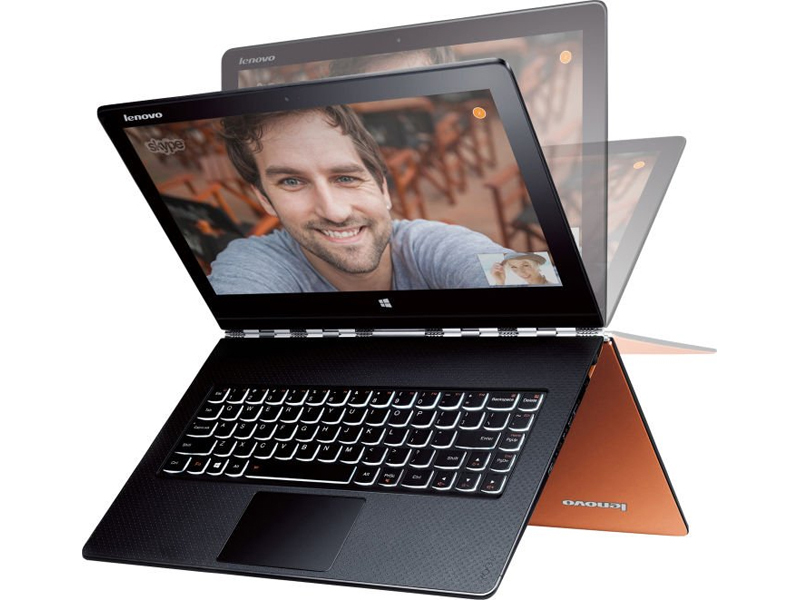 Intel’s Broadwell processor provides sufficient performance that is comparable to thin Haswell devices, but there are smaller boundaries for the thermals – despite the active cooling of the Yoga 3 Pro. 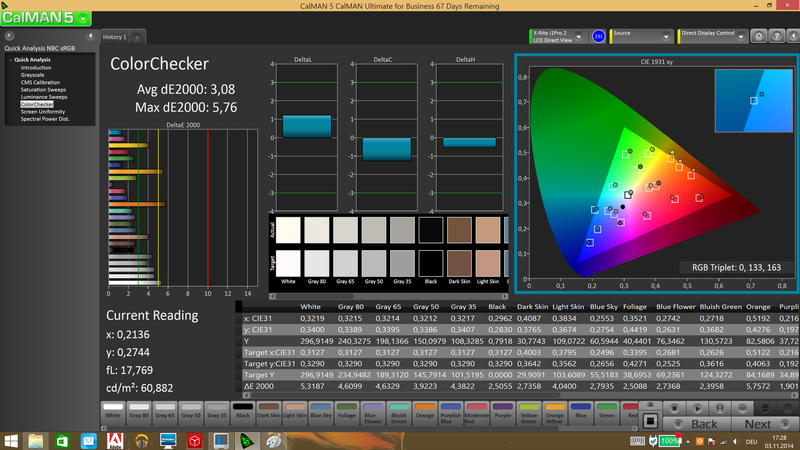 The QHD+ panel creates a nice picture, but it could be a bit brighter and have a higher contrast. The Lenovo Yoga 3 Pro also does not seem to be a runtime wonder. A comprehensive review of the device will be available on notebookcheck.net soon.